I am on a roll! 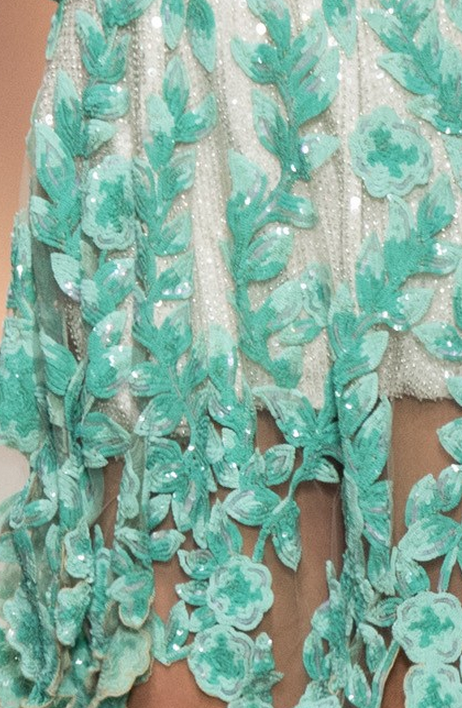 This dress from the Blumarine Spring/Summer 15' collection caught my eye because I always loved a blue-green tone in combination with white and brown. The flower and leaves details are absolutely gorgeous. The mix of different textures and elements also makes the dress very interesting. This design was made entirely free-hand with a very fine brush that I bought from an art store recently. It is my new go to nail art brush! The one I purchased is called Cotman 000 paint brush from Midoco. There were a lot brushes of similar thickness, but I just chose the most inexpensive one. It has been a while since I've been out of the beauty box game. Mostly because the amount of products I had was piling up to the point where I had to start giving it away to friends or made a conscious effort to use it up. But it is good to see that some Canadian beauty box subscription companies are still going strong. I still remember the days when it was still a relatively new concept. $10 a month for a chance to get some full size goodies and sample other products? You can't go wrong with that! However, over the time when I was still a very active subscriber to multiple beauty boxes (about 4 a month! ), I saw a lot of changes. The quality of service and products declined and complaints from customers mounted up on various social media channels. Some companies changed up their subscriptions plans to adapt to the saturated market (ie. Loose Button Luxe Box), a lot of companies went up in prices and unfortunately some companies went under (ie. Glymm, Glossybox Canada). I find it difficult to recommend a specific service to subscribe to because they stand out in their own unique way. Some will give you more high end popular brand samples, some may give high quality products from lesser known brands. It really depends on your taste, what you value and what you are comfortable paying for. I was recently contacted by Glossybox USA to review their March Glossybox. I was actually surprised to hear from them because I recall getting an email from Glossybox Canada that it will no longer be available. As it turns out, Glossybox USA is available to us Canadian gals and shipping cost an additional $5. Just from reviewing their website, their service is exactly like any other beauty subscription service. Every month you get a box of 5 beauty products. Just basing off my previous Glossybox Canada experience, they were most generous with their full size sample. Looking at their website, it seems like it's still a similar case. For US customers, you can choose to pay a monthly fee ($21 US/month), bi-yearly fee ($126 or $21 US/month) or you can save by subscribing to a 12 month package ($220 US or $18.33/month). For the Canadian ladies, taking shipping and current exchange rate into consideration, that's about $33 CAD/month, $198 CAD/6 months, and $356/year. These prices can be higher because the customer may need to pay the taxes on these items. The price seems higher than what I'm use to seeing (with the lowest being around $12 for Canadians). But if they consistently give full size products in their box, I guess the cost can be justified. Now let's take a look at what's in side! I'm slowly coming back for my nail art hiatus. 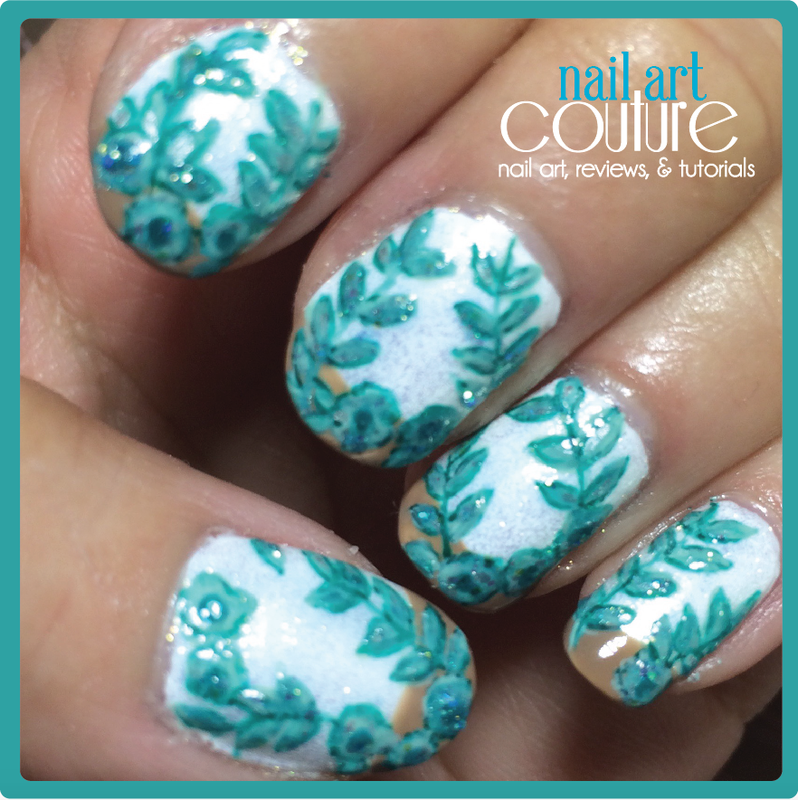 In honor of fashion of week, I knew I wanted to create a fashion inspired nail art. 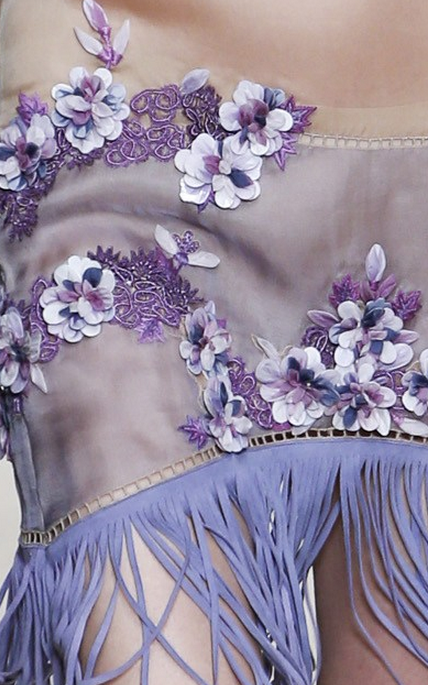 After going through a few runway albums, I fell in love with this gorgeous purple floral dress from Alberta Ferreti's Spring/Summer 15' Collection. Maybe I'm just extremely bias towards my favorite colour. I like that it's a mix of different texture and shading, which makes the dress so beautiful and interesting.